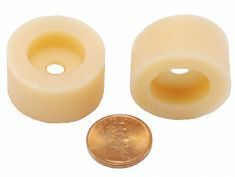 These large rubber parts are used on the volume control, and tone control shafts to keep the chassis from bumping against the front of the cabinet. Sometimes they need replacing or are missing. They are found on 1937 and 1938 radios that use a sub chassis. Used on all 1937 models EXCEPT Models: 37-33, 37-84, 37-93, 37-600, 37-602, 37-604. All other 1937 Philcos used these. Used on all 1938 models EXCEPT Models 38-12, 38-14, 38-15, 38-33, 38-35, 38-93. All other 1938 Philcos used these.